Spring has arrived and the carnival is coming to town, what’s not to love about that! 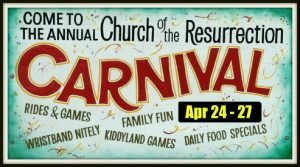 Once again, Wallingford’s Church of the Resurrection is sponsoring their annual carnival April 24th through the 27th in the parking lot adjacent to the church. The weather forecast for the opening of the four day event is cloudy with an 40% chance of rain on Wednesday and Thursday,with temps near 60 degrees. But regardless of the weather, everyone will enjoy the fun, games, rides and great food that always accompanies this much anticipated first carnival of the season! The venue will open nightly at 6pm and features a midway with more things to do than you can shake a stick at! Some of the fun to be had includes games of skill, chance and just plain old luck (NOTE: must be 18 years or older to play games of chance), rides for young and old including a Ferris wheel, roller coaster, and a Fun House. Other foods available will include clam chowder, hot dogs, hamburgers, cheeseburgers, french fries, fried dough, eggplant parmesan, chili, sausage and peppers, meatballs, and clams on the half shell (with Budweiser on tap while supplies last). There will be plenty to satisfy your sweet tooth, too, with delights such as ice cream, carrot cake and cannoli to be had. And of course, the obligatory refreshments will also be available in the form of coffee, iced tea, soda, water, beer, wine, lemonade and hot chocolate. Last but not least, there will be raffles big and small, and plenty of games and rides for kids of all ages, with a $20 wristband for rides available on Wednesday and Thursday and a $25 wristband for the rides on Friday and Saturday. If you’d like to download a copy of the event flyer, just CLICK HERE. There’s always something to do at this fun-filled extravaganza; we’ve gone every year and we never fail to have a great time and we NEVER leave hungry! So if you’re looking for something to do April 24th – 27th, look no further than the Church of the Resurrection Carnival, 115 Pond Hill Road in Wallingford. There’s plenty of free parking and admission is free too, so don’t miss it!